Sayyid Mohammed Hussein Fadlallah died at the age of 75 in a Beirut hospital Sunday after a long illness. While he was not exactly Hezbollah’s spiritual guide, as was often alleged, he was one of the most influential shapers of modern Shiite political thought in both its peaceful and more violent incarnations. The world-renowned Shiite cleric was born in 1935 in the Iraqi city of Najaf. Najaf hosts one of the great centers of Shiite learning, to which Fadlallah’s Lebanese father had come to study. When the Iraqi monarchy fell in 1958, Fadlallah and other young clerics believed that they would lose the Shiite masses to communism unless they offered them a politics of the here and now, as well as a theology of the hereafter. So he helped found Iraq’s Dawa party. Dawa would not only give rise to Hezbollah and other radical Shiite organizations, but would also produce one of Iraq’s first democratic governments under the leadership of Dawa Prime Minister Nouri al-Maliki. Fadlallah returned to Lebanon in the 1960s, not to his father’s small southern village but to Beirut. If the stylish, multilingual port on the Eastern Mediterranean was famous then as the Paris of the Middle East, the Shiite masses, long suffering under the country’s Sunnis, Christians and their own feudal leadership, were not welcome at the party. Fadlallah spoke to downtrodden Shiites by creating a clerical language drawn from the seminary as well as Nasser’s pan-Arabism and the lexicon of the international left. Imperialism, Fadlallah said, threatened Islam, and Muslims had a duty to take up arms against the ravenous West—especially America and its local client Israel. When the Palestinian Liberation Organization was thrown out of Jordan in 1971 and turned Lebanon into its forward base for war against the Zionists, Fadlallah enlisted his community alongside the Palestinian cause. Iran’s 1979 Islamic revolution energized Shiites throughout the Muslim world, an epochal event that Fadlallah welcomed. The revolution’s most successful export was Hezbollah—the Party of God—an Arab Shiite organization created by Iranian Revolutionary Guard troops in the Bekaa Valley. Hezbollah’s notoriety dates back to 1983, when it killed 241 U.S. servicemen by car bombing the Marine Barracks in Beirut. Fadlallah, who was known to be close to Hezbollah, distanced himself from the operation, even as he understood that merely the appearance of having influenced this act of “resistance” bolstered his reputation. Fadlallah had some convinced that he was a voice of moderation. He had relatively progressive views on women’s rights, which included issuing an edict against female circumcision and opposing honor killings. During the ’90s, Fadlallah had a falling out with Hezbollah and Iran. The sticking point was the concept of Velyat-e Faqih, or guardianship of the jurist, which held that the supreme religious and political authority for Hezbollah was Iran’s Supreme Leader, Grand Ayatollah Ali Khamenei. Pride played an issue for Fadlallah, who was a true scholar—a marja al-taqlid, or source of emulation—for millions of Shiites around the world. 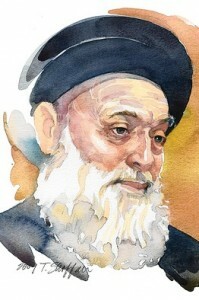 Khamenei was a mid-level cleric whose stature rested on his ability to maneuver among allies and adversaries in Tehran. While Fadlallah railed against the Iranians, Hezbollah started buying off Fadlallah’s Lebanese followers and instructed them to follow Khamenei. Lebanon’s 2006 war with Israel brought destruction to the Shiite community as well as Fadlallah personally, whose compound and institutions were bombed.